MPs from the borough joined their parliamentary colleagues in a series of historic indicative votes on different ways forward on Brexit. Wigan MP Lisa Nandy voted in favour of motions on negotiating a comprehensive, UK-wide customs union with the EU and the one on Labour's proposal for a close economic relationship. She also backed plans for UK membership of European Free Trade Association (Efta) and European Economic Area (EEA), known in Westminster parlance as Common Market 2.0, and a proposal to revoke Article 50 two days before Britain headed for a No Deal exit. 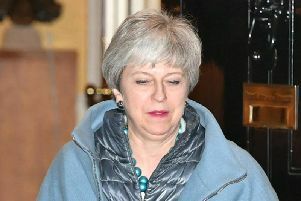 She voted against the motion saying Britain should simply leave without any agreements in place on April 12 and did not vote on proposals requiring any Brexit deal to be put to the public, calling for "preferential trade agreements" with the EU and remaining in the EEA and rejoining Efta but without joining a customs union. Makerfield MP Yvonne Fovargue backed just two of the eight options: the Labour Party plan and the calls to negotiate a comprehensive customs union. She also rejected the plan to put any Brexit deal to the people and also voted against the No Deal motion. She did not vote on the other four. Jo Platt, who represents Leigh in the House of Commons, backed the Labour plan and the comprehensive customs union motion and also gave her backing to Common Market 2.0. She also voted against No Deal and the "preferential trade agreements", offering no vote on the confirmatory public vote, revoking Article 50 just before No Deal and being in Efta and the EEA but not the customs union. Perhaps unsurprisingly, given the strength of his support for Brexit, Conservative MP for Bolton West Chris Green, whose constituency includes Atherton, voted very differently. He gave two votes in favour, to the motion backing leave with No Deal on April 12 and to the one seeking "preferential trade agreements". He voted against all the other six options put forward. Unlike the usual parliamentary voting process where MPs walk through the aye and no division lobbies, parliamentarians were given all the indicative vote options on a sheet and could indicate as many votes in favour or against as they wished. It is now expected the matter of the different Brexit options will be brought back to the House of Commons on Monday.